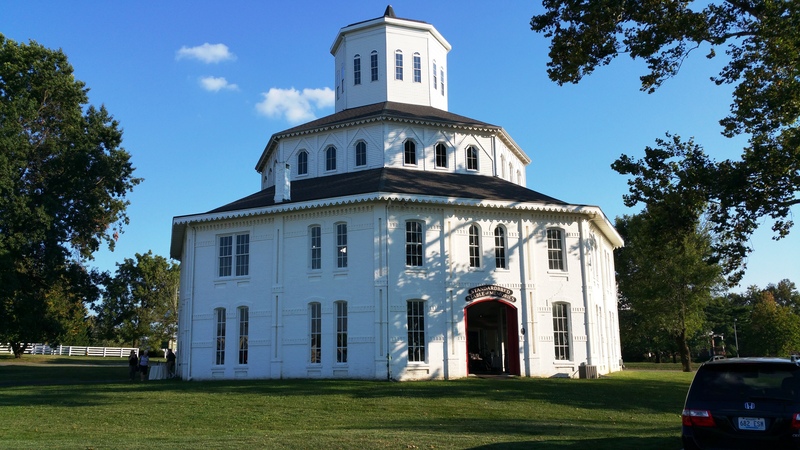 The Blue Grass Trust’s award-winning deTour program hosted a tour of Historic Floral Hall (also known as the “Round Barn”) at the Red Mile Harness Racing Track in September, 2016. 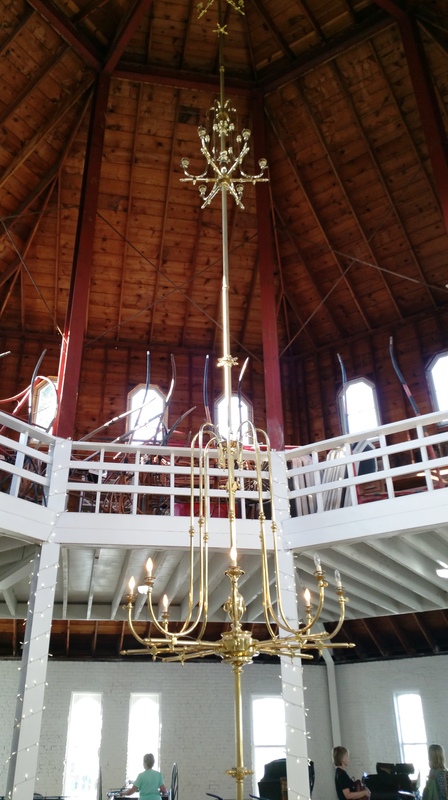 It houses the Standardbred Stable of Memories museum and also serves as an event space. Normally it’s only open by special arrangement, so it was great to finally get to see the interior of this iconic 1875 John McMurtry* building. Lexington is fortunate to have a number of McMurtry-designed structures, although Floral Hall may be the most eye-catching. It was originally designed as an exhibit hall for floral displays at the Kentucky Agricultural & Mechanical Association fairgrounds. It’s a 4-story brick octagonal building, topped by a large windowed cupola. The interior is a large open space, in keeping with its original use as an exhibit hall. In 1896 it was purchased by the Trotting Association and converted to a horse barn. It became a museum in the 1960s. *John McMurtry (September 13, 1812 – March 3, 1890) was a builder/architect who worked in Lexington, Kentucky. Architectural historian Clay Lancaster described McMurtry as the “man whose work is most representative of the nineteenth century architecture of central Kentucky.” Many of McMurtry’s projects, including Floral Hall, are listed on the National Register of Historic Places. Posted in Architecture, Day Trips, Fayette County, History, Horse Racing, Kentucky, Museums, Octagon Houses, Road Trips, This Place MattersTagged BGT deTour, Blue Grass Trust, Floral Hall, John McMurtry, Lexington, Red Mile, Round Barn, Standardbred Stable of Memories, Trotting AssociationBookmark the permalink. What a lovely old building! I love architecture–the details and the architectural elements that please the eye make so many old buildings beautiful. thank you for posting. I was enchanted by this building, Kathy. We’re really fortunate here in Lexington to be able to tour so many interesting buildings with the deTour program. I love old carriages and old buildings. Glad you visited there so I could enjoy your pictures and descriptions. Did you see the photo of the governess cart? I was particularly taken by it.